In the past 24 hours, PlayerUnknown’s Battlegrounds Mobile has soft-launched on Android devices in Canada, presumably to test things out before the wider launch. While Kotaku UK’s office is not in Canada, we did manage to get our hands on a build of the new game, and have spent this morning trying our very best to win a chicken dinner. After several hours I have to say this is a surprisingly robust port. It’s no replacement for the PC and Xbox versions if you’re at home, of course, but a straight comparison isn’t really the point here. This is all about getting a reasonable approximation of PUBG onto mobile devices, both opening up the game to the huge mobile audience and giving the obsessives a way to keep playing everywhere. And if you’re really craving some PUBG on the move (PUBG in the pub? ), this does a great job of scratching that itch. Here are the basics: PUBG Mobile obviously runs at a far lower resolution and texture detail than its PC counterpart, but crucially it still supports battle royales with the full complement of 100 players. You’ve got access to the default Erangel map, and the game plays out as it always did: parachute down, run from the blue area, be the last one alive, and hey presto. From initial testing it appears the game can only be played over wifi—I tried out my usually sturdy 4G connection, but was unable to use it to play here. However! I could play by tethering my phone to another 4G phone and tricking PUBG Mobile into thinking it was on a wifi connection. There are some nice changes that suit the mobile format, such as your avatar automatically picking up ammo for equipped weapons, which makes it easier to keep moving at a decent pace. The major issue here will be no surprise. PUBG Mobile runs well and is functionally identical to the main game, but the area where it struggles is controls. I mean, it’s a shooter on a phone. You’ve got two virtual joysticks on-screen for movement and aiming, with the movement stick in a fixed position rather than adapting to finger positioning—meaning if you ‘miss’ with your thumb you’re out of luck. As well as your thumbs covering part of the screen, there’s a bunch of action buttons taking up additional screen real estate. These buttons are probably as small as they can be while remaining functional, but even then their size means you sometimes miss a tap or it doesn’t register. I started learning the rhythm for taking part in contextual actions, but it involved unlearning my usual PUBG muscle memory, and also getting used to tapping buttons without any tactile feedback. I did attempt to use a bluetooth controller and a slide on controller, but neither was recognized by the game. Tough luck: it’s slightly fiddly touch controls or nothing. To be fair this at least keeps the playing field somewhat level, as a controller-wielding player in here would be shooting fish in a barrel. My biggest issue ended up being lack of precision in small spaces or engaging in firefights. Touch controls simply have a hard time with precise twitch shooting, and aiming accurately in the heat of the moment is often a crapshoot. Once you’ve aimed, you’re having to take your hand off one of the ‘sticks’ to tap the fire buttons (which thankfully exist on both sides of the screen), then quickly go back to the virtual sticks. It’s messy, it’s imprecise, and if you take it too seriously it’ll quickly become a source of frustration. Add in the low draw distance, and reliably doing well is tricky at best. With all that said, and despite this port missing many newer features like vaulting, I have to say that playing PUBG Mobile was a lot of fun. I’m not a particularly adept PUBG player on console anyway, so being on an even playing field where nobody was able to pull off high-level techniques actually had upsides. I found myself enjoying running around folks blasting away, with maybe one in four of our shots landing. I even got a chicken dinner! Whether you’ll enjoy PUBG Mobile or not comes down to the expectations you bring to it. If you want the ‘big’ PUBG experience, you’re gonna need to play the original. 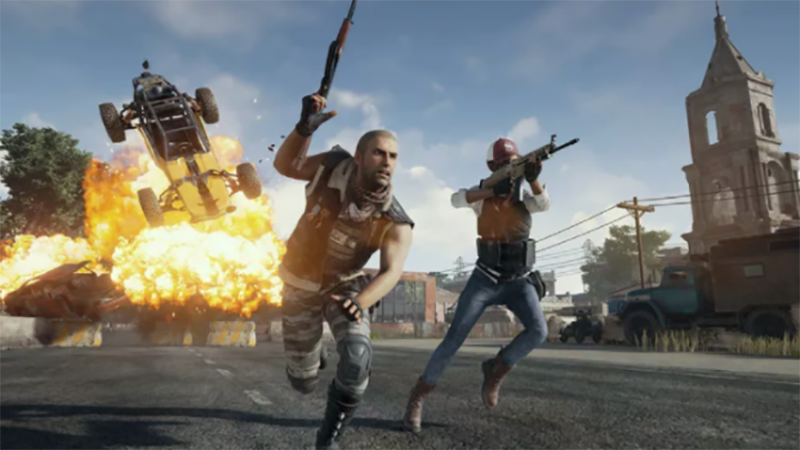 But if you want something that does a decent job of capturing the feel of PUBG, then for all its faults PUBG Mobile delivers a slimmed-down and somewhat less intense battle royale. You’re not going to be scoring headshots from 100 meters that often. But you will be able to sit on the couch running around shooting folk and bashing them in the head, and basically enjoy a bit of a laugh. It’s not quite the full chicken dinner. But for a takeout, this hits the spot.